Do you need expensive knives to be a badass in the kitchen? The good news is that you don’t have to. Number one is learning technique and the knife comes second. Just like photography,. Sure, a good quality camera will help you get those exceptional photos, but it’s also your skill in seeing and know how to get that great shot. 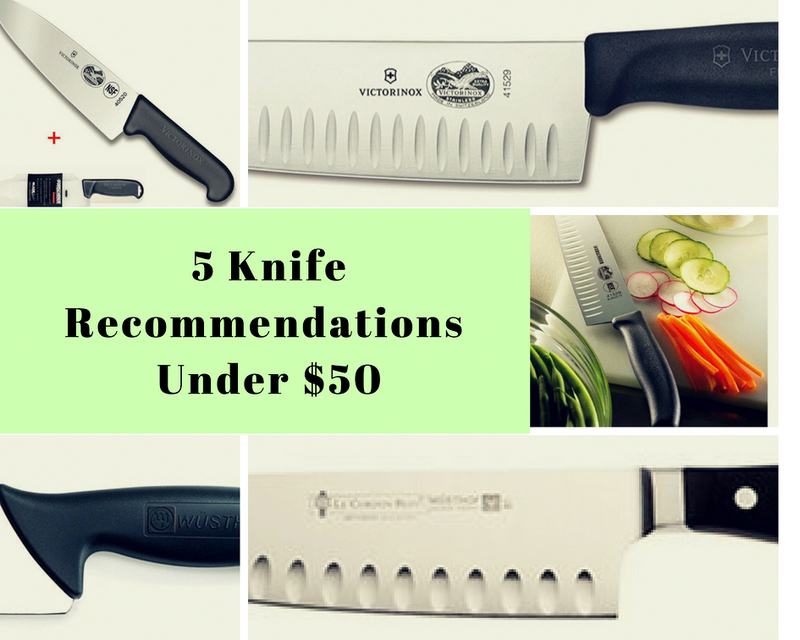 I made a list for knife recommendations under $100, but there are some that don’t want to make that kind of commitment right away – I get it. You don’t need to spend so much money on a knife, but you also should not buy some of the cheapest knives that won’t last long. You’ll end up spending more in the long run. I’ve gathered this list on 5 knives that I have used in the past and can trust their name. You also have to consider how much you cook and use your knives and that would determine which list you should go by. As always, I say you do not need an entire knife block. You just need a Chef’s knife, a serrated knife and maybe a paring knife. As always, please ask me questions and I am happy to help! Please note that these are amazon affiliate links and if you choose to purchase from them, I will earn a commission without an extra cost to you. Thanks for supporting my blog! This is very similar to the Wusthof above. I have not personally used this one but for the price, it truly is worth a shot. It’s stamped, not forged which basically means that they literally “stamp” out knife shapes from large sheets of metal like a cookie cutter process. That is not necessarily a bad thing, and your wallet will thank you. I’ll throw an extra one in the list because J.A. Henckels is a really decent company and you cannot beat their prices too. I currently am using a J.A. Henckels santoku knife at home and I love it. this one is a great deal for the knife, but the bolster on this one is pretty big and it can feel heavy over time. I only suggest this if you chop once in a while.